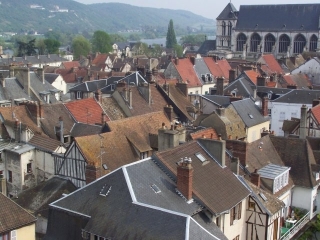 A view of the town of Vernon, three miles from Giverny, seen from the top of the Archives Tower. On the right the church is Vernon’s collegiate church dedicated to our Lady. It hides the houses of Giverny on the other bank of the Seine river. Although Vernon was severely damaged by bombings during the last world war, this part of the town remains untouched. 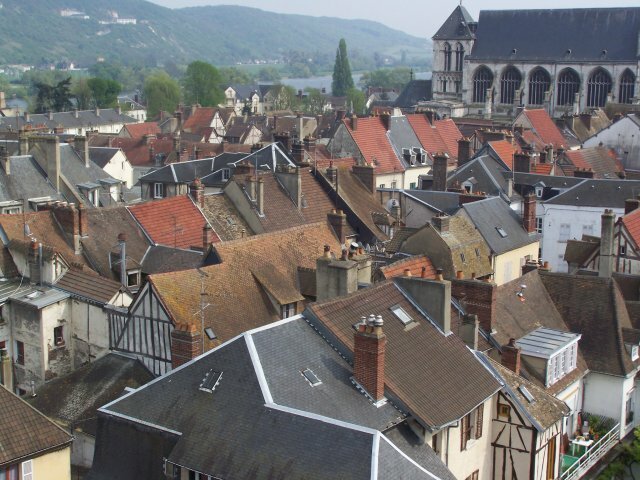 Slated or tiled roofs top small town houses piled up along narrow streets. Some of them still exhibit their half timbered walls typical of Normandy. The houses in the foreground are as old as the keep of the castle on which I was standing, they date back to the 13th century.